Recently, Rob Griffiths offered insight into how he produced his episodes of the Macworld Video. This resulted in some collateral hue and cry for information on how we produce the Macworld Podcast. As the podcast’s host and producer I can offer some insight of my own on that subject. I produce the podcast from my home office. My microphone of choice is a vintage AKG C 414 EB. The microphone is attached to a Mac Pro via CEntrance’s $150 MicPort Pro 24bit/96kHz XLR-to-USB mic preamp. The microphone is mounted on a Heil PC-2T boom stand. With a boom stand you dispense with the kind of table and cable noise you pick up when using a microphone with a table stand. I’ve recently placed a $20 Nady MPF-6 pop filter in front of the mic to help reduce plosives (popped p’s). We occasionally record roundtable discussions at the Macworld offices. For those recordings we use M-Audio’s $450 Fast Track Ultra USB 2.0 audio interface with four inexpensive Samson microphones. The Fast Track Ultra is connected to an iMac and the recording is captured in GarageBand ’09. As our staff is scattered around the country, we conduct our interviews over Skype’s free VOIP software. When recording with Macworld editors, we ask that they capture their parts during the interview using the audio editing software of their choice and then upload their sides of the conversation to a transfer server, where I retrieve them and piece the parts together in GarageBand. We do it this way because the recording is much cleaner than if I capture the Skype stream. Wonderful as Skype’s audio quality is, there are times when it can produce ugly audio artifacts. It’s a lot to ask of a non-staffer to go through the rigmarole of recording and uploading their parts. So for guests who aren’t Macworld employees I record the Skype stream and hope for the best. To do that I use two separate tools—Ecamm Networks’ $20 Call Recorder and Rogue Amoeba’s $32 Audio Hijack Pro. I use both tools so that should one fail, I have the other to provide the recording. (It’s very bad form to go back to a guest and ask for a redo. Having a redundant setup helps avoid these situations.) I then use the audio tools included with Call Recorder to split the captured stereo track into separate mono files—one with just my voice and the other with the voices of the other participants. To give voices a fuller tone, I select each track and, in GarageBand’s Browse tab, select the Podcasting entry and then the Male Radio or Female Radio preset, depending on the gender of the speaker. I then click on the Edit tab and enable the Compressor effect. The compressor not only evens out the volume of the speaker, but gives me the option to pump up that track’s volume if I’ve tapped out the volume control in the track mixer. As much as I can, I attempt to balance the volume of the various speakers and remove errant noises—cell phone interference, table taps, coughs, and other unwanted sounds. To remove these occasional noises I’ll either split the track and cut out the noise I don’t want to hear, or expose the automation controls and draw in a volume curve that makes the noise inaudible. If I’m faced with a track that has a fairly constant din in the background—such as an air conditioner or traffic noise—I apply BIAS’ $129 SoundSoap 2. It’s a useful plug-in for sampling and removing these kinds of noises. Once I’ve finished mixing an interview, I choose Share -> Export Song to Disk. In the sheet that appears, I leave the Compress option unchecked in order to export the file in the AIFF format. I choose AIFF rather than a compressed format such as MP3 or AAC because I not only want the cleanest version I can create, but also because I process these files after the fact with The Conversations Network’s free The Levelator. This is a wonderful utility that attempts to balance the volume across the file—increasing the volume in quiet parts without raising the roof on louder bits. It works only with uncompressed files and performs at its best when only voices are present. Introduce music and the resulting file can sound odd. Except when we record a Pundits Showdown episode, our podcast’s format is templated—opening music, host’s introduction, a news and commentary section, interview #1, advertisement, interview #2 (or the second half of long interview), and closing. Sandwiched between each vocal segment is one of five musical themes plucked from the main theme. I composed and recorded that theme in GarageBand—using prerecorded loops for the drum and bass parts and then playing the rhythm guitar, lead guitar, and synth parts (all played from a MIDI keyboard, as I don’t play guitar). After recording and mixing the interviews I record my host bits—the introduction, news and commentary, interview introductions, advertisement, and closing. As with the interview tracks, I apply the Male Radio preset to my voice and add the compressor effect. I then import the mixed interview files into tracks within the GarageBand project, applying no effect to them because the voices already had effects applied in the original mix. Finally, I shift the various audio bits into position. GarageBand offers automatic ducking—a feature that reduces the volume of background tracks (music tracks, for example) when a primary track (my voice, for instance) plays at the same time. Welcome as this feature is, it’s not one I use as the ducks don’t sound natural to me. Instead I draw the ducks manually. To do so, I click the automation arrow in the music track, make sure that Track Volume appears in the automation area, and click points where I want a fade to begin and end. I generally begin a fade within a second of where the voice enters or leaves. A complete fade out—when I want to drop the music completely so the voice can take over—lasts a couple of seconds. Volume curves drawn in for ducking and fading a music track. I try to keep the length of the podcast to under an hour—40 to 50 minutes is typical. That provides enough material to fill most commutes yet doesn’t go on so long that listeners become bored with the subject or the people speaking. We produce two versions of the podcast—an MP3 and enhanced AAC version. The enhanced version includes chapter marks, graphics that identify chapters, and embedded URLs within each chapter that lead to stories or sites related to that chapter’s subject. The enhanced version is the one delivered by iTunes when you subscribe to the podcast. The advantage of an enhanced podcast is that the listener can easily navigate through parts of it. For example, if they’re not interested in the subject of the first interview, they can quickly move to the second interview by choosing a different chapter from iTunes’ Chapters menu (if they’re listening on their computer) or skip through chapters on an iPod or iPhone. Our listeners seem to like these enhancements and it surprises me that more podcasts don’t include them. Chapters within a recent Macworld Podcast episode. Adding chapters is simply a matter of selecting the Podcast track, clicking the Info button at the bottom right corner of the GarageBand window, and dragging chapter art either from the Desktop or from within GarageBand’s Media Browser into the proper location in the Podcast track. 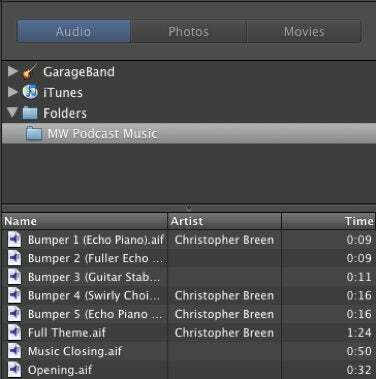 For example, the Macworld Podcast logo file goes at the beginning of every episode. I then drag in a picture of my face that aligns with where I introduce myself as the host. An image that reflects the subject of an interview will mark the beginning of that interview—a Snow Leopard box shot, for example, if we’re discussing OS X 10.6. The Media Browser is really helpful for material we use routinely. I’ve created two folders on my Mac—one that contains artwork that appears in each podcast (the Macworld logo, my picture, and an advertiser’s graphic, for example) and another that contains the music tidbits we use for each episode. By dragging these folders into the appropriate tabs of the Media Browser, their contents are easily selected and dragged into the podcast. Our music bits available from the Media Browser. When you drag images into the Podcast track, chapter marks appear in the Podcast Markers area at the bottom of the window. To resize or reposition artwork, just double-click the thumbnail image in the Artwork column and use the Artwork Editor that appears to adjust the size and position of the artwork. To enter chapter titles, URL titles, and URLs, just click in the appropriate field and start typing. To complete the tagging I move to the information pane to the right of the GarageBand window and enter the podcast title, artist, composer, and enter a description. This information is then appended to the enhanced version of the podcast. Because we create both MP3 and AAC versions of the podcast I export each episode twice. Exporting the podcasts couldn’t be easier. 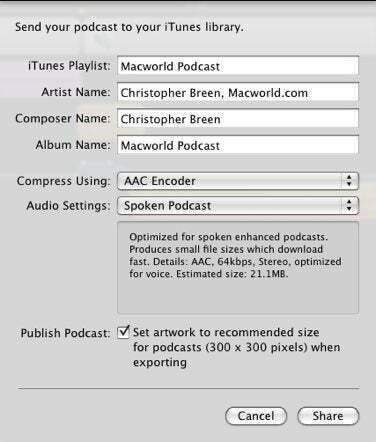 Just choose Share -> Send Podcast to iTunes and in the sheet that appears choose AAC Encoder from the Compress Using pop-up menu and Spoken Podcast from the Audio Settings pop-up menu. Click the Share button to begin the export. For the second version, choose MP3 Encoder and Spoken Podcast. We use this Spoken Podcast setting because it provides audio good enough for voice and creates files that aren’t terribly large. Typically our podcasts weigh in at around 20MB. Choose an export format and enter tags in the Share sheet. In this sheet you can also enter the name of the iTunes playlist where the encoded episode will appear, its artist’s name, composer’s name, and album name. It’s worth your while to fill these fields in correctly as the information you include will appear as ID3 tags for your podcast. Fail to do it and you’ll have to do your tagging later in iTunes. When GarageBand finishes exporting the episode, it appears in iTunes and starts playing. The enhanced version of the podcast is about a megabyte larger than the MP3 version thanks to the embedded artwork. Once the two versions appear in iTunes I simply drag them out and send them up the line where Curt Poff, our online managing editor, prepares them for our website and iTunes distribution.